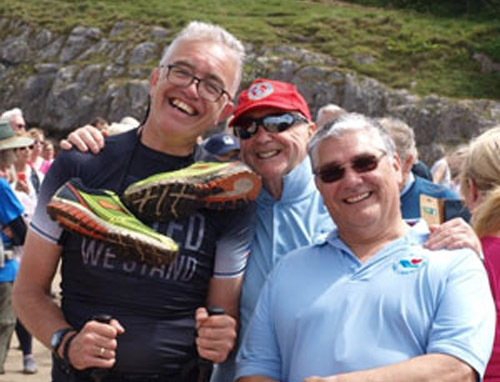 The invitation has already gone out for this year’s Morecambe Bay Walk and as 100’s start to prepare for the annual trek, this is a reminder of one man’s epic journey last year to overcome severe medical problems and complete the walk and raise over £1,200 in doing so. Pictured from left to right, are: Neil, Dave and Les as they were about to set off onto the sand. 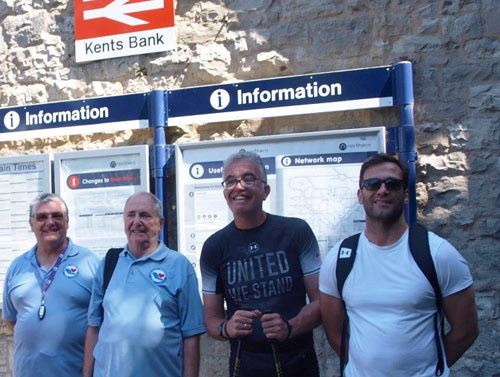 Some members of St Paul’s Lodge No 5459 who meet at Widnes Masonic Hall decided to take on the Morecambe Bay Walk on Saturday 17 June 2017 to try and raise monies for the charities during the tercentenary celebrations. The walk is from Arnside on the West Lancashire side of the bay to Kents Bank on the Cumbria side of the bay. The walk varies depending on numbers and is scouted out by Cedric Robinson MBE, the Queens Guide and his team. The walk was approximately 8 miles. Four members of the lodge took part; Dave Berrington who was the WM, Les Williams who was the senior warden, Neil Worthington who was the junior warden and Chris Farley who had only joined the lodge in November 2016. The Provincial Grand Master Tony Harrison was in attendance and wished everyone good luck on the walk. He was unable to walk as he had another function to attend that afternoon. Pictured from left to right, are: Les, Dave, Neil and Chris at the end of the walk. One of the important things to know is that Neil Worthington is suffering with a neurological condition called cerebral ataxia. This condition affects his movement, co-ordination and his speech and it makes him look like he is drunk. This walk was going to be a very hard slog for Neil due to this condition and we went to assist him while on the walk. He had trained hard for the walk and was often seen walking along the A580 East Lancashire Road using walking poles. Knowing that Neil would not be able to keep up with the other walkers the St Paul’s Lodge group started off slightly earlier than the rest of the walkers. The first part of the walk was along roads and rocks and goes through woods and a holiday park and they waited on the edge of the sands for the other walkers. Starting out on the main part of the walk with the other walkers, the group soon found themselves near the rear. This might not sound much but the walkers ahead, walking on the sand in large numbers, they managed to bring water up from under the sand and we spent most of the trip walking through water that could be a couple of inches deep. There were also deeper areas of water that we had to cross. Walking for several miles on wet sand with all of the ridges going in various directions, from the receding tide, makes your feet quite sore and your legs ache. Pictured are: the PrGM from Cumberland and Westmorland, Cedric Robinson MBE (with the stick) and Masons from both provinces gathered together on the sands. Eventually getting to the other side, the group went for refreshments at the Abbot Hall Hotel, on the personal invite of the Provincial Grand Master of the Province of Cumberland and Westmorland Freemasons. It was a great pleasure to meet with the other Mason from the next Province, including their Provincial Grand Master and many of his team, who had made the walk. The team then caught the train back from Kents Bank to Arnside and had a very tasty fish and chips dinner. As can be imagined, Neil was very tired but pleased that he had made the effort. They then made their way home and started to try and raise some much-needed funds for the charity. A Just Giving Page was set up by Chris Farley and other money was collected. It totalled £1,252.00p which is a magnificent effort. During their walk across the bay, the team were invited to attend Lodge of Peace and Unity No 314 for the installation of APrGM David Winder on Monday 8 January 2018 at the Masonic Hall, Saul Street, Preston so that he could congratulate the four team members and in particular Neil for their efforts. Unfortunately, Les Williams and Chris Farley were unable to attend on the day. Pictured left from left to right, are: Neil Worthington, David Winder and Dave Berrington at the Preston Masonic Hall, prior to David’s installation. David had the overall responsibility for the walk from the West Lancashire Province. Pictured right: Les is a keen artist and painted this picture for Neil as a reminder of his great efforts and also to celebrate his 50th birthday. Story and pictures submitted by Dave Berrington.